Every time it rains in Santiago it gets cold and overcast, the streets flood, and it stays generally miserable for as long as the water falls. The reward is the clear, smog-free view of the snow-covered Andes when the clouds clear. I’ve tried to take some pictures of the mountains, but their majesty is often overshadowed by traffic, power lines, and buildings that obstruct the view. The last time the rain came I started scouting out the highest place I could get to. I decided to see what the top floor of our apartment building offered. I went searching for some kind of balcony, but no luck. 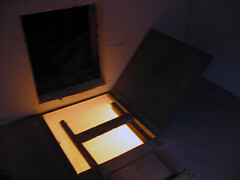 Finally I stumbled into the closet with the garbage chute where I saw a hole in the ceiling with an overhanging ladder. I pulled it down and climbed into the attic. There I found another ladder that lead to the roof. I pushed the hatch open and at the top I found the place to take the picture I wanted. Then I put everything where I found it and left the garbage chute closet as if it had been untouched. It’s a good thing you didn’t get pummeled by garbage during your trek. Nice photo! Great example of the lengths photographers go to get the right shot. Did you shoot with a wide angle lens, or is it stitched together? The picture is stitched together from three or four separate photos that I took with my Canon point-and-shoot camera. The software that Canon distributes with its consumer cameras does a fantastic job of stitching images together.